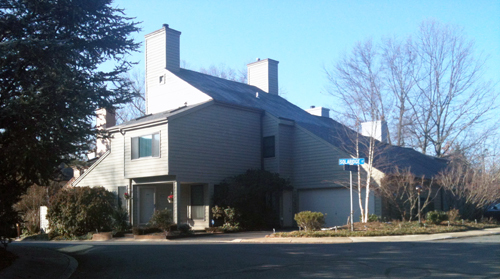 Developed in 1974 by Jeffery Sneider & Company, the Links Pond Cluster of townhomes in South Reston features 3-level, 4-bedroom brick and siding homes. The 67-home neighborhood borders Reston National Golf Course, and features the pond for which the cluster is named. It’s a common sight in the summer to see people spending lazy days fishing in the pond. This is a great community for young families. The schools — Terraset Elementary, Langston Hughes, and South Lakes High School — are all close. And as the children grow, there is plenty of parking to accommodate your needs as the number of cars you have grows. 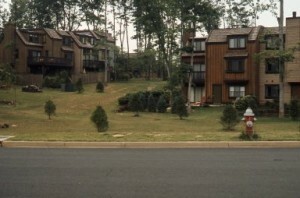 Each home has one assigned parking space, with plenty of additional parking on South Lakes Drive. With easy access to the Reston Association paths, it’s easy to get out for a run or walk. 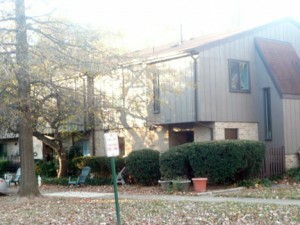 Links Pond is close to both South Lakes Village Center and Hunters Woods Village Center, home to the Reston Community Center. Residents also have easy access to the Toll Road and the Wiehle metro. As with every cluster that is part of Reston Association, Links Pond residents have access to the RA pools and tennis courts—nearby Glade pool with its waterslide is a favorite for kids! Are You Feeling Green this Week? Kalypso’s may be Greek 364 days out of the year, but on March 17, they’re as Irish as anyone! Celebrate the Irish in you too with food and drink specials that will keep going through the night. The music starts at 4:00 with Mark Scott playing acoustic guitar. At 8:30, local favorite Sam Gunderson (blues and rock) takes the stage. It is guaranteed to be a blast! Clyde’s is serving Irish food and offering drink specials throughout the day, and a St. Patrick’s Day party will take place in the evening, with a DJ starting at 10pm. Why start celebrating at noon when you can start at 9 a.m.? Join the fun with a Kegs & Eggs breakfast (if you’ve never done it, get down there — it is great). Lunch and dinner menu starts at 11 a.m. and goes until midnight. They’ll have giveaways and drink specials all day. Music by local favorite Bobby Flynn. When you’ve finished your Kegs & Eggs, head on down the street to Ned’s. This Irish bar will have live acoustic musicians from noon to 9 p.m. Irish dancers will perform at 4 p.m., 6 p.m., and 8 p.m. At 9 p.m., My Hero Zero takes the stage. Of course, traditional Irish food, Guinness and green beer will be available all day. This authentic Irish pub will have Irish music starting at noon, bag pipes and Irish dancers —along with all the traditional Irish fare. Can’t make it here on March 17? Well, O’Sullivan’s is so serious about their patron Saint that they celebrate on the 17th of every month! The Brogue, as the locals call it, was hosting St. Patty’s day long before there were any other Irish pubs in town. They do it right! They will have a series of concerts throughout the day, with authentic Irish music performed with lunch or dinner. Reservations are required if you even want to consider getting in the door. But if you don’t get a reservation, no worries — they also offer a St. Patrick’s Day Pub Bash with live entertainment and Irish beer that starts at 10 a.m. First come, first served. I suggest getting there early if you want to get in.